The biceps brachii muscle (or simply the biceps) has two heads located in the upper extremities; these are referred to as the long head tendon and the short head tendon. Both span the length of the forearm, from the shoulders to the elbows. In between the shoulders and the elbows, the two heads join to form a single muscle body. The role of the biceps in the shoulders is controversial; opinions vary widely from it being basically functionless to it playing a crucial role in shoulder stability. On the other hand, it is widely accepted that the biceps play their primary role when acting on the elbows, in order to bend and supinate, the latter of which is most effective when the elbow is bent at 90o. The long head of the biceps tendon (LHBT) is susceptible to injury due to its location and forces that act on it, both in and out of the shoulder joint with the most common being bicep tndonitis. Injury to the LHBT is usually found in the young athletic population, between the ages of 18 to 35 years, especially those that take part in swimming, gymnastics, martial arts and throwing and contact sports. The LHBT is sometimes considered as a part of the rotator cuff, which is a group of muscles and tendons that connect the forearm to the shoulder. 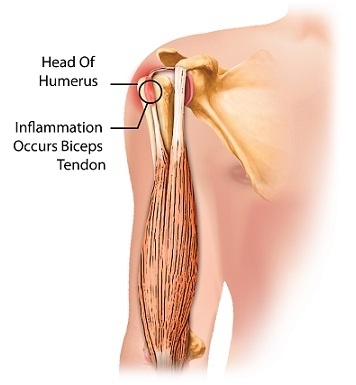 While the term “tendonitis” implies inflammation, many times the cases of bicep tendon injuries are actually tendinosis, which is degradation due to overuse. The repetition in overuse injuries causes micro-damages to the tendons as they slide to and fro in a groove found in the upper arm bone structure called the bicipital groove. This may lead to the tendons rupturing or tearing. Bicep tendonitis account for 96% of all rotator cuff tears. These injuries are rarely in isolation and are often linked with other pathologies. Up to 50% of the population is thought to have rotator cuff tears, making bicep tendonitis a common source of shoulder pain. Oftentimes, these injury cases become chronic. Previous injury. This may be rotator cuff tears, tendonitis, or biceps tendon rupture on the opposite side of the body. Pain at the front or side of the shoulder, which may travel down to the forearm, even possibly affecting the hand. Pain aggravated by overhead reaching, pushing pulling, lifting and sleeping on the affected side. Tenderness at the bicipital groove. Clinical diagnosis for bicep tendonitis should include a physical examination and a thorough history. Patients usually experience a deep throbbing ache at the front of the affected shoulder, which may radiate down to the hand. If the biceps have ruptured, patients may describe a painful popping sound. Tenderness at the bicipital groove is the most common symptom. Many physical tests have been developed in order to diagnose bicep tendonitis, but due to the nature of the tests, the coexistence of a rotator cuff injury cannot be ruled out. Examples of these tests are Yergason, Neer, Hawkins and Speed tests. Injecting a local anaesthetic may help to determine the origin of the pain, hence allowing the doctor to make a more accurate diagnosis. If a local anaesthetic is injected into the space between the shoulder blade tip and the rotator cuff tendons (this space is called the sub-acromial space), for example, then this would relieve pain for a rotator cuff tendinitis injury, but not for bicep tendonitis. If using local anaesthetic, it is safe to inject the sheath that surrounds bicep tendons, but clinicians should be careful not to inject the tendons themselves, as this may cause a rupture. Ultrasonography can be used to increase the accuracy of the injection. In order to eliminate the possibilities of other injuries, plain radiography should be performed. This eliminates the possibility of shoulder impingement. Once this is done, an ultrasonography can be used to visualize the biceps tendons. Magnetic resonance imaging (MRI) and computed tomography imaging (CT) have also proven useful for visualization, especially if it is suspected that there are other injuries. The athlete must rest the injured shoulder until it is pain free, after which exercises can take place for a full recovery. If conservative treatment is ineffective after three months, surgery may be considered. Ahrens, P. M., and Boileau, P. (2007) The long head of biceps and associated tendinopathy, J Bone Joint Surg Br 89, 1001-1009. Lippert, L. S. (2006) Elbow Joint, 4th ed., F. A. Davis Company, Philadelphia. Churgay, C. A. (2009) Diagnosis and treatment of biceps tendinitis and tendinosis, Am Fam Physician 80, 470-476. Redondo-Alonso, L., Chamorro-Moriana, G., Jiménez-Rejano, J. J., López-Tarrida, P., and Ridao-Fernández, C. (2014) Relationship between chronic pathologies of the supraspinatus tendon and the long head of the biceps tendon: systematic review, BMC Musculoskeletal Disorders 15, 377. Moore, K. L., and Dalley, A. F. (1999) Clinically oriented anatomy, 4th ed., Lippincott Williams and Wilkins, Philadelphia. NIAMS. (2013) Questions and Answers about Bursitis and Tendinitis, NIH.